The house has three bedrooms; the master bedroom has a queen-size bed with stunning sea views up and down the Atlantic Coastline with a private balcony and a lovely built-in bath for two. 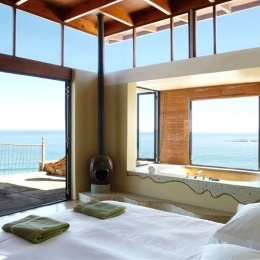 There are sea views and a stunning private outdoor shower. The other two bedrooms have lovely cliff views and share a full bath. The house comfortably sleeps 6 with a sleeper sofa adding capacity for another 2 guests. This villa (featured in the Phaidon World Atlas of Architecture) is metres away from the Atlantic Ocean and offers a special holiday in a spectacular setting. There is no better way to watch a sunset or the whales frolicking in the bay ahead. It has have been designed in such a way to take full advantage of these breathtaking views. Situated within 40 minutes from Cape Town and 15 minutes from the legendary Cape Point and Constantia Valley's wine farms. The house is the perfect venue for intimate wedding/receptions as well as a romantic hideaway for your honeymoon/anniversary.